On 13 October 1762 “the little child from Salzburg”—Wolfgang Amadeus Mozart—came with his father and sister Nannerl to Schönbrunn. 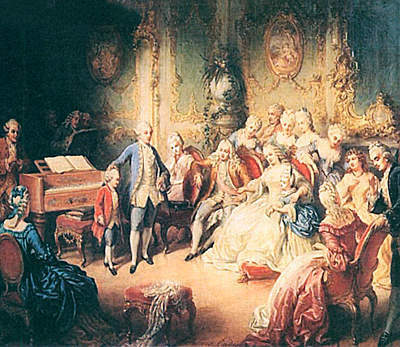 He played the harpsichord in the presence of the Empress, the Emperor, the court composer Georg Christoph Wagenseil and various of Maria Teresa’s offspring, including Antoine who was three months older than the prodigy. The child played “marvellously,” was the verdict, and he was rewarded with an honorarium of 100 ducats and presents from other nobles. He was also presented with a fine outfit that had belonged to the Archduke Max, a coat of lilac colour and a moiré waistcoat, all trimmed with gold braid. The concert was repeated, again at Schönbrunn, a week later.